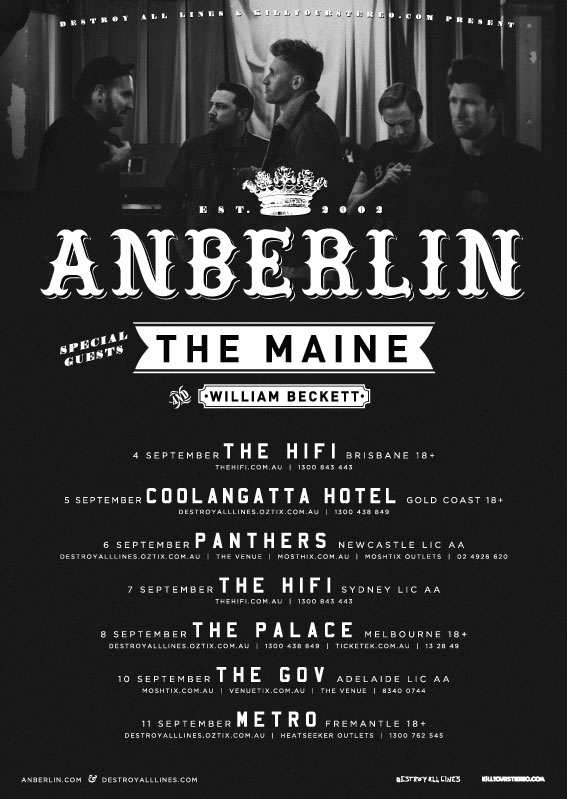 Floridian 5-piece, Anberlin will celebrate their 10th anniversary by bringing brand new anthems and a pair of international support bands, The Maine and William Beckett (The Academy Is), to Australia this September. band has progressed from some of Australia’s most intimate club venues to some of the country’s biggest stages. Australian crowds are certainly in no position to disagree. Their last Australian tour - on which they revolutionised the tried and tested live performance format by including acoustic songs, covers, requests and even live QnAs - was a massive success. Their promise to linger at their merch table after each performance, to greet every adoring crowd member, remains the stuff of fan faction and has set the bar impossibly high for their peers. Who knows what inspired performances they may extend to their loyal Australian fanbase on their eighth visit to our shores.